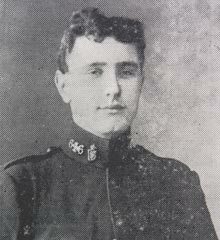 Robert Howe was born on 29th November 1889 and was the son of William and Mary Howe of Coagh and later of Belfast Before emigrating to Canada he served his time in the drapery business with Mr. Joseph Geddes, Cookstown and spent six years in the Royal Irish Constabulary. In May 1916 he was seriously wounded, and die in hospital on 3rd June 1916. Robert is buried at Lijssenthoek Military Cemetery, Belgium. 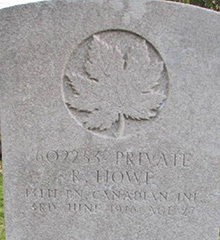 8 Private John Shaw Friend of Private Howe and pictured together in photo.